Evangelical Alliance UK: What kind of United Kingdom do we want to become? In a statement ahead of the prime minister triggering Article 50 the Evangelical Alliance has set out how churches and Christians can contribute as the UK prepares for Brexit. Theresa May triggering Article 50 of the Lisbon Treaty marks the official beginning of the UK's departure from the European Union. It also begins the long process of negotiations that will formulate what that departure will look like. An Alliance spokesperson said: "We may have voted to leave the European Union, we may now be starting the process of leaving, but we've still got to work out what kind of United Kingdom we want to become. "As Christians, we are commanded in the Bible to 'pray for all who have authority, that we may live peaceful lives'. We will be praying for the prime minister, her Cabinet, and all those involved in the negotiations around our withdrawal from the EU in the coming months. We pray that God would give His wisdom to those He has given authority and influence, and that the outcomes of the negotiations would be just. "The challenge of the future is not just for the UK but for the rest of the European Union. There are ongoing challenges for the EU, which spans from the Atlantic to the borders of Turkey and Russia. 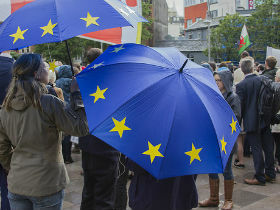 The need to improve the connection between those governing and the governed is as relevant as ever and challenges to the EU institutions from politicians in other countries mean reform is likely to be essential in coming years if the union is to survive. Although we will be leaving the European Union we are not leaving Europe. "The official negotiations between the EU and the UK government aren't the only important conversation to begin now that Article 50 is triggered. This historic moment is a time to speak to each other about what we want our society to be as we leave the European Union. This is not a conversation for our leaders alone, nor is it the exclusive possession of those who took one side in the referendum campaign. It is for every person in the nations of the UK to contribute. "As Christians we have a vital contribution to make to these conversations. We speak out for a society that upholds freedom, maintains justice and pursues truth, in which we pursue the difficult task of loving our neighbour as ourselves. We share the prime minister's desire for a fairer society for all. We look forward to engaging in that conversation in the months ahead."